In all my travels I have never drank a beer so … drinkable. It has an enviable pedigree, a spotless reputation, and a quotidian character. It smells like cream and orchards. Brown, like the edges of a Tiki flame or the bottle that contains it, with a head like the plateaus of the desert. It’s dirty white like my stucco after a monsoon rainfall. Caramel raisins. Browned toast with cinnamon. The wife’s kiss. Chipotle lime marinated steak and grilled fries with southwest seasoning. This beer is a beer festival weekend, open and free. Or it’s late summer in ’88 with “Hysteria” cranked to 11. Yes, yes it’s Def Leppard in a bottle. Rock on. They haven’t hit the Adrenalize era yet, good thing. Black Butte is an erudite, worldly mentor speaking to you of all that can be. 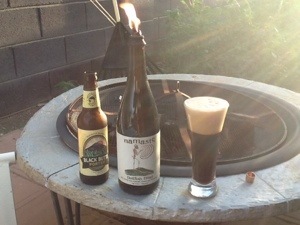 Long live Black Butte Porter. The imagery of summer is the most sublime. Crisp blue sky; verdant lawns dripping with cool water; children riding bikes and running and jumping, having been freed of schoolroom shackles; the list goes on. And the geniuses at New Belgium think they can bottle the greatest season of them all. Let us see if the impossible becomes possible. It’s copper! It’s pale yellow! It’s a chameleon. Is it supposed to be changing tincture like that? Well colors do morph in summer out here in the desert. Sometimes, of course, that’s delirium. I don’t think this beer is making me delirious. It’s just more brilliant in the light. The head is puffy and white, and , fine, right, I’ll go there – just like cumulus clouds in the summer sky. It does have great legs. If that isn’t summer I don’t know what is. Oh, it’s a pale ale. Really, that’s all? Granted, this one is slightly more intense than a normal one and slightly less intense than an IPA. Like Ranger, with water. And lemon drops. The heft of grain is not apparent. The hops and water are mostly on display. Hmmm, lawn and water. It’s a slender bodied beer, light and refreshing, and if that ain’t summer what is? Grassy. Citrusy hops. Nectarines, possibly. The perfume of one of those earther girls, the Eco-terrorist kind. Only a good looking one. Is that summer? Football, on TV and on iPad, since they weren’t televising my dang game, the Cowboys vs Seahawks. Oh, that isn’t food? Good call, you should all be substitute referees. Summer is ending. Sadness always overtakes me at this realization, though respite from the heat is welcome. Still, Somersault actually seemed to capture pieces of summer. I was waiting for the soundtrack to hit me and it never did. But freedom was there. And a few other highlights of summer. Fine. Fine. It was good. What, are those New Belgium brewers some kind of artists?